NCC queen snake field technicians, Megan Ihrig and Elizabeth Miln, set up a drift net fence to survey for the endangered queensnake (Regina septemvittata) near a suspected hibernaculum/over-wintering site in the Lower Maitland River Valley Natural Area (Photo by NCC). 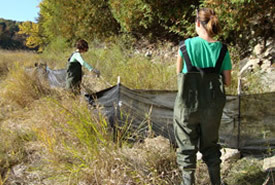 The Nature Conservancy of Canada collaborates with a wide range of conservation research partners. These partnerships involve researchers from academic institutions, governmental and non-governmental organizations and consultants.